GB Racing’s revolutionary new tough, high-impact composite material made from 60% Long Glass Fiber Nylon provides ultimate in protection for your machine! The tough long glass fiber nylon is a high impact material that is designed to absorb energy without cracking in most situations. Designed with aesthetics in mind and to be installed over your existing OEM engine cover. This is a bolt on product, allowing fast and easy removal and/or replacement, not a replacement cover. GBRacing products are the clear benchmark in high-performance, bolt-on motorcycle protection for the short circuit, road racing and street bike community. GB Racing is the only company to have received FIM product approval from 2009 through to 2020 on its range of bolt-on non metallic secondary engine covers, along with MCRCB, FFM, IDM, AMA/Moto America, CIV, IDM, FFM and World Endurance approval. WGP products also have two patents granted: Improved Composition (Patent #GB2479405) for the material used in our engine protection and a patent for Reverse Wear Indicators (Patent #GB2532535). 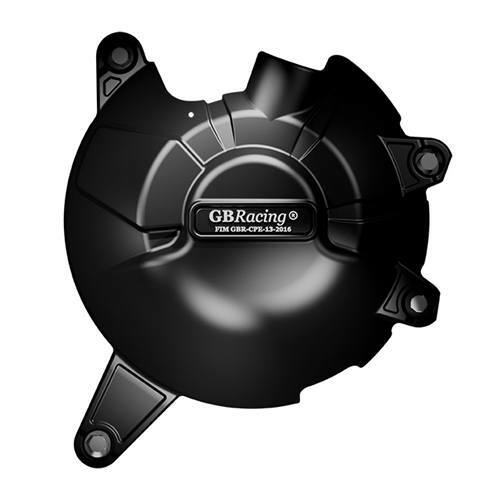 GBRacing’s alternator crank covers are designed to provide the best protection to your motorcycle's alternator. Designed to fit both the standard stock casings and the modified kit alternators. The alternator is located on the left hand side of your motorcycle. All covers come supplied with replacement bolts. There is no need to remove stock casings or gasket seals. The STOCK refers to the stock casings, as you would see on your bike in the showroom. The KIT refers to factory (HRC / YEC ) casings, normally the alternator cover, where race teams would purchase factory alternators that produce minimal charging of the battery, to reduce inertia and therefore increase performance. Therefore, the KIT alternator cover is designed for a kit alternator casing which has replaced the standard casing. The GBRacing clutch cover will provide protection and style to your motorcycle's clutch. This clutch cover is fitted over the existing clutch on the right hand side of your motorcycle. All covers come supplied with replacement bolts for your clutch cover. There is no need to remove stock casings or gasket seals.